After looking through some sprites used in 1.5 games, specifically World Link, I have found a decent amount of sprites that are of good enough quality to be used as 1.8 sprites, or can be of high enough quality with some slight modifications to their colors or to their details. I have decided to compile together all the sprites I see as being able to be used for new shard forms, which creators can use for their hacks or original games or whatever. I've also heard that some of the more high-quality ones came from a 1.5 hack called "Merry's Version" but I'm not very well educated in the 1.5 department. This thread's purpose is a place for people to post sprites from 1.5 games that could be usable in 1.8 games, sprites from 1.5 polished to be 1.8 sprites, or custom sprites entirely. Polished the pallet to removed the "darkness" from her, so to say. Still needs the 1.8-styled hair shading, though. Another pallet cleanup for insertion. 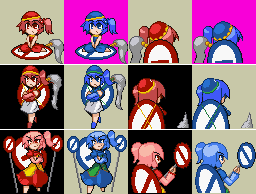 Touhoumon Blue actually had some nice sprites for Mitori and Sasha, actually. 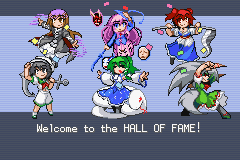 yes I realize they're edits from Touhoumon 1.8 sprites. I edited the OP to include just plain old 1.5 sprites. People can post regular old 1.5 sprites if they match up to 1.8's standards. I'll have to take a look at the 1.5 sprite dump. 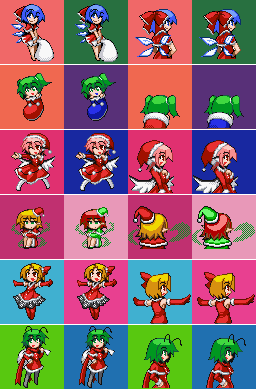 The only 1.5 sprites i've seen are those from Aichiya Sanae's hacks as I cannot find a Touhoumon Blue ROM, but the actual 1.5 sprite dump may have some goodies in it too. it should be noted that some of those ARE 1.8 sprites with 1.5-esque shadings. Touhoumon Blue has a lot of unique mons in it (it has Unzan as a stand-alone mon, as well the PC98 Mirrors, among others), I'll upload the patch tomorrow when I can get my computer online. Is anyone looking for Mitori/Sasha sprites? Hemo actually made some nice 1.8 ones. Either way, I touched up a few sprites from the http://www.tohofes.com/news/dot_list.html and gave them insertable sprites. Regular Noroiko: (I forget what the backsprite for this one is. I think shizuha mixed with daiyousei? I actually wanna see if they're different or not. 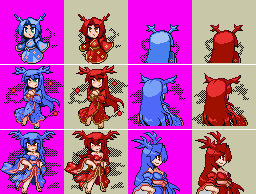 These sprites are amazing and I'm probably gonna edit Sekibanki's backsprite to make it match. Also found this on the Pixiv. For anyone who wants bikini bunny. Speaking of pixiv, I think the sekibanki sprite is from pixiv. if anyone can find the source of it, I'd greatly appreciate it. There was one for a bunch of fan characters but none of them had backsprites. I have backsprites for all four, if anyone is interested. Holy, these are wonderful, nice sprites guys!